We’re big fans of the “Kids React” and “Teens React” series here at Techlicious. There’s something magical about watching youngsters take a look at ancient technology like green screen computers for the first time – their reactions remind us of how far we’ve come since, techwise. Recently, the Teens React folks showed a handful of teenagers a highly dated educational video on the subject of the Internet. Its subject matter is terrific – remember Netscape Navigator? – as are the haircuts on the 1990s actors. It’s a fun way to kill to some time and reminisce about how far we’ve all come online. And, you know, how far Yahoo.com has come, too. 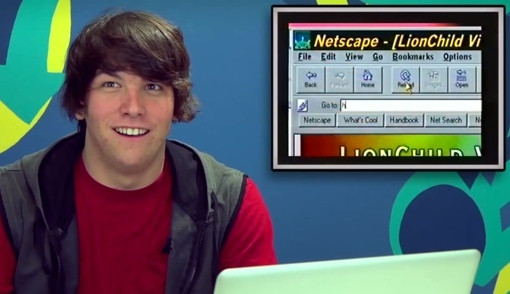 You can watch the full Teens React to the 90s Internet video below. Want more fun from the guys behind 'React?' Check out Kids React to the original Nintendo Game Boy and Kids React to a vintage Sony Walkman. I certainly hope this in NOT the next generation. Talk about narrow minded brats. Clearly, these teens have had little boundaries set. They could not deduce that was 20 years ago. All they did was try to act cool, make fun of the kids in the video, call the Mom a bitc-. Have they got a rude awakening when they hit the job market. Attitudes like that get nowhere fast. Yep, they sound like teenagers! Seriously, if the teenagers acted like adults, these videos would be pretty boring. It’s common for teenagers to do things like make fun of their parents’ generation and “try to act cool”. And belittling teenagers for belittling us, is a little like the pot calling the kettle black. Especially when we were all kettles at one point in our lives. It’s nice to be reminded that all services were NOT unlimited back in the old days. So some things are better nowadays.